The need for a safe place to rest, refuel and debrief is as old as conflict itself and modern warfare is no exception. What has changed, however, is the range of threats a soldier needs to protect himself from. 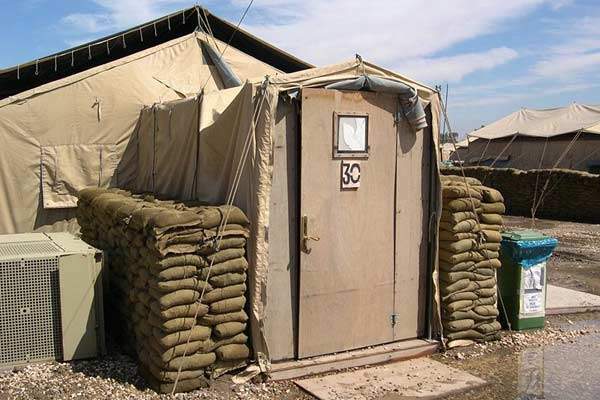 Daniel Garrun examines the various shelter options available to the modern deployed soldier. US soldiers using sandbags to protect a shelter facility in Afghanistan. A army headquarters tent with added sandbags for protection and insulation. A soft-walled military tent city. 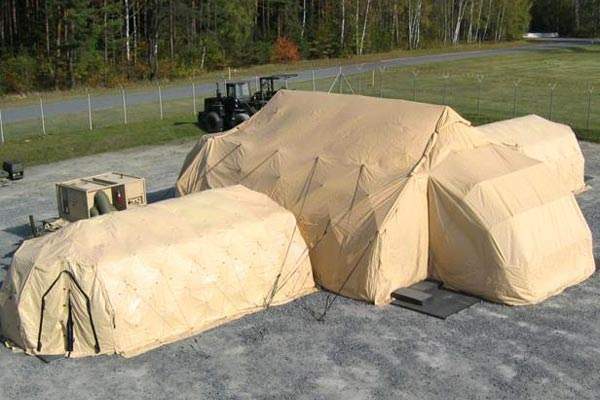 The US army DRASH system of networked tents. In today’s war zones, combatants are increasingly threatened by nuclear, biological and chemical warfare. The need to protect against such horrors is fuelling a new generation of military shelters. The diverse range of military shelters comprises everything from simple rectangular rain sheets to entire tented villages, such as Camp Victory in Afghanistan, which alongside housing also provides communications, support, medical, decontamination and even aircraft hangar facilities. Despite the demands required of a military shelter, its basic purpose remains protection against the elements. The crucial part, however, is how it does so. Outdoor gear company Diamond Brand is a leader in forward-deployed shelter systems and has produced thousands of special operations tents from simple triangular tarps to specially designed tank and HMMWV crew tents. The motto reflects the essential properties of military shelters, which must strike a fine balance between being easy to transport, and being rugged and tough enough to protect against the vagaries of modern warfare. Speed and ease of deployment are also crucial, as is the need to keep logistics to a minimum, especially in rough weather or dangerous conditions. Essentially there are two kinds of army shelter: soft walled and rigid. 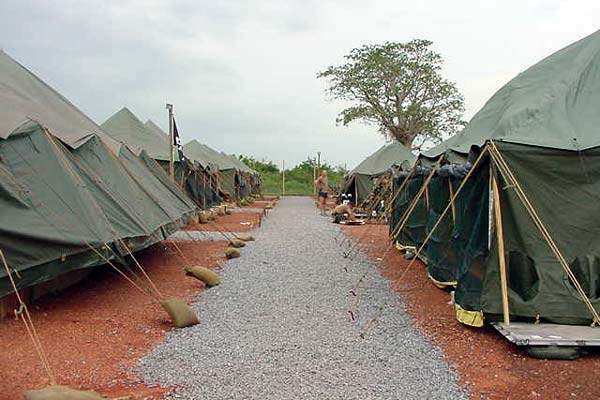 Soft-walled shelters mostly comprise tents and tarpaulins made from fabrics and textiles, and are used mostly by forward-deployed soldiers and special forces. The Nemo Equipments range of Nemo, Morpho and Tanto low-weight hostile environment tents, for example, are built to be set up within 15 seconds, and are designed specifically with soldier gear in mind. Rigid shelters, however, are more permanent and can be constructed from aluminium, wood, foam or other lightweight materials. 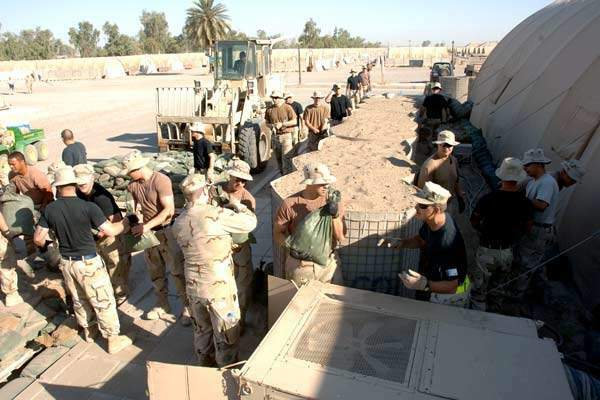 Most rigid structures also use materials such as canvas and can be assembled and arranged to create multipurpose spaces, such as mass sleeping quarters, storage, administrative headquarters and even field hospitals and operating rooms. To tackle the trade-off between weight and set-up requirements and structural integrity a few critical advancements have been made in shelter structure over recent years. One of the most important has been in AirBeam or air support technology. US-based Vertigo has been a leader in AirBeam technology, which involves using an easily inflatable AirBeam pressure system to keep tents erect. Vertigo uses a fibre-reinforced elastomeric composite that can be formed into a multitude of different shapes. It has been successfully used in applications including the world’s biggest rapid-deployment aviation hangar operated by the US Army. The value of AirBeam technology is that it replaces traditional tent poles and rigging, which are heavy to carry and awkward to set up, especially on a large scale. Rigid structures, however, carry the benefits of a substantial structure. In this regard another US company, Utilis, has been a leader in folding frame designs, which have seen considerable action by both US and European forces. Utilis shelters use a traditional frame design, which then uses an innovative system of ropes and pulleys to quickly set up a protective PVC outer skin and interior liner. The shelter has few parts and interconnected pieces, and has been successfully passed wind, driven-rain, and snow load testing required by the army at its Aberdeen test centre. The US Army’s Natick soldier systems centre, which researches ways to maximise soldier efficiency, has named energy management as its primary focus in shelter development because of the extreme environmental conditions found in Iraq and Afghanistan. The shelters used in such locations need to be heated and air conditioned, which causes an enormous drain on logistics and the need for a fuel supply chain. Natick is therefore focusing its efforts on developing shelters that can protect against extreme conditions. Scientists are focusing on developing new materials that block solar rays as well as allow good airflow, reduce heat build-up and allow wind penetration. The centre is also researching a flexible photovoltaic system called PowerFilm that can be integrated into the solar covers to capture and store solar power that can be used to create a self-powering shelter capable of powering up portable electronics. At the cutting edge of such technologies being used in the field is the deployable rapid-assembly shelter (DRASH), which integrates all power, lighting, heating and cooling systems into one package. At the cutting edge of this integrated system, DHS Technologies, which makes the DRASH, has recently announced research projects to build shelters capable of matching power supply to power need, to make sure that all systems are only using what they need and no more. Other improvements include incorporating a wide ready-made insulation barrier, novel insect repellents and the development of a fielded shelter that can protect sensitive equipment from outside electro-magnetic signals and radio frequency interference. While protecting soldiers against blasts and explosions has never been a traditional role of portable soldier shelters, the threat of insurgency and the growing threat of nuclear warfare have forced the military to drive innovation in this sector. The Natick centre is currently developing a modular ballistic protection system (MBPS), a lightweight armour system not very different from soldier armour, which can be used where mobility prevents the use of sandbags and concrete. The MBPS, which has been developed as the MBPS RW to armour rigid structures and as the MBPS Temper to protect fabric structures, will be also be used to provide immediate protection during the early stages of a deployment before stronger structures are in place. Protecting troops from nuclear and biological attacks, however, is a much harder task. Although no protections against nuclear, biological and chemical (NBC) contamination are currently in use, the military has developed a candidate product called the NBC-PC. The NBC-PC is a cover made of Saranex, a barrier material produced by Dow Chemical Company made from low and high-density polyethylene, which has been shown to provide 72 hours of protection against chemical warfare agents. A new joint operational requirements document is currently being developed by the technology readiness evaluation for contamination avoidance of seaports of debarkation that will hopefully lead to adoption of the protective cover. As temporary constructions, military shelters require a reasonably large trade-off between function and ease of deployment. Innovation in the sector, however, has sought new smart materials to redress the balance. The good news is that not only will these innovations contribute to the safety and efficiency of the war fighter, but that through an intelligent transfer of technology, the same driving force of innovation can also be used as a powerful humanitarian resource. In situations such as Iraq and Afghanistan, and also in areas ravaged by natural disaster, the devastation to local infrastructure is immense and the need for shelter and a place to eat, refuel and heal is just as great for the local community as it is for the engaged soldier – if not more so.